At the Independent Spirit Awards Christian Bale and Joaquin Phoenix were spoofed by show host Steve Coogan and comedy writer Frank Coraci. For those who don’t know, Frank Coraci often collaborates with Adam Sandler on various movies. 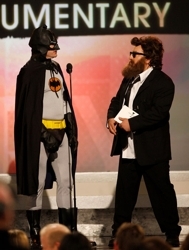 (Image L-R of Steve Coogan (as Bale) and Frank Coraci (as Phoenix) at 2009 Spirit Awards – DailyCeleb.com – All Rights Reserved). Coogan dressed up as Bale in full Batman gear complete with mask. Coraci wore a full beard and sunglasses to mimic Phoenix and his latest hairy appearance. Both men had the appropriate costumes for their parts. The two comedians were presenting The 2009 Independent Spirit Award for Best Documentary category. 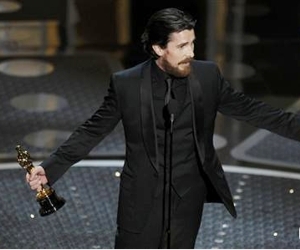 In their opening presentation Coogan, as Bale, alternated between giving Coraci, as Joaquin, a hard time for being a bum with random cursing and swearing. 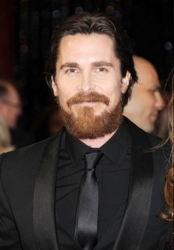 Actor Christian Bale has been the much debated topic of the media as well as talk shows. The View recently discussed his bad behavior on his latest movie set where he cursed out a stagehand. The tongue lashing was caught on tape and leaked to the media. All of Hollywood and the media have been buzzing about Joaquin and his recent announcement that he was quitting acting to become a rapper. He vowed to dedicate his career to music and leaving the film industry behind. Joaquin promptly grew a beard as well as growing his hang long creating a shaggy appearance. The Spirit Award for 2009 Best Documentary went to Man on Wire. This entry was posted on Sunday, February 22nd, 2009 at 3:18 am	and is filed under 2009 Independent Spirit Awards, Celebrity Bites, Hollywood & Mane, Movies & Films, Ramblings On Current News & Events. You can follow any responses to this entry through the RSS 2.0 feed. Both comments and pings are currently closed.